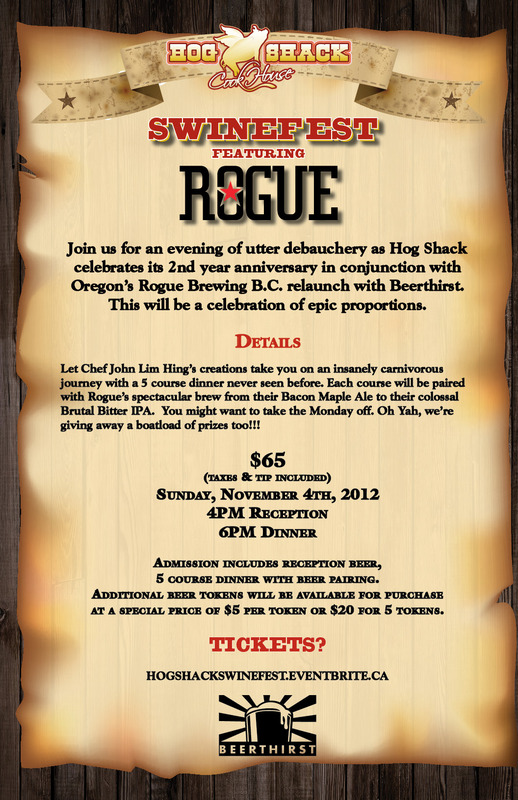 Join us for an evening of utter debauchery as Hog Shack celebrates its 2nd year anniversary in conjunction with Oregon’s Rogue Brewing B.C. relaunch with Beerthirst. This will be a celebration of epic proportions. This ain’t your average pub grub beer dinner. Let Chef John Lim Hing’s creations take you on a fierce carnivorous journey with a 5 course dinner never seen before. 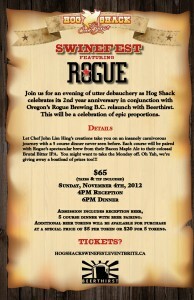 Each course will be paired with Rogue’s spectacular brew from their Bacon Maple Ale to their colossal Brutal Bitter IPA. Oh yah, we’re also giving away a whole SHWACK of DOOR PRIZES!! 5 course dinner with beer pairing. at a special price of $5 per token or $20 for 5 tokens.